For young people to realize the importance of repentance and confession in our journey toward salvation. Prior to the young people arriving, set up the room for the activity by placing obstacles between the entrance to the room and an icon of Christ placed on the other side of the room. It is important that the room is very dark so that the young people will not be able to see the obstacles. If you have a larger group, consider using multiple rooms with multiple advisors to complete the activity in a timely manner. Each participant is brought into a very dark room, one at a time. An advisor is at the other end of the room holding an icon of Christ. In the dark room, nothing should be visible. Once the participant is in the room, the supervisor should briefly flash the light on the icon of Christ. The participant should then proceed toward the icon of Christ. 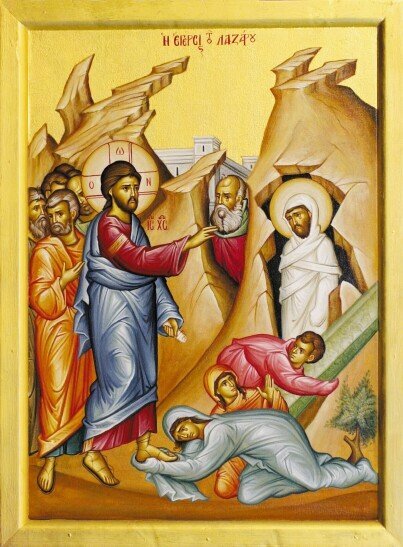 If they loose their way and ask for help, the advisor may once again flash the light on the icon of Christ. Repeat this process until the participant finds their way to the icon. How can this activity be compared to our journey as Christians? In our lives as Christians, we are constantly walking toward the Light (of God). While on this journey, we may very easily lose our direction; ending up on another path that leads us away from Christ. A decision must be made at this point ø do we admit that we are lost, or not? If so, we must then find a way back onto the path. In our journey as Christians, the Bible states that a way back to the path leading to Christ is found through repentance. A change, turning our lives back toward Christ. By admitting that we have separated ourselves from Christ and desiring to reunite with him. The Church helps us with this process of repentance by offering the Sacrament of Confession. Confession provides us with the opportunity to affirm to God that we realize we have lost our way, and we want to return to the path leading toward GodÕs light. Then GodÕs grace becomes manifest through the sacrament, and our sins are forgiven. In the activity, when we lost our direction, all we had to do was state that we were lost, and ask for help. The icon was quickly illumined so that we could once again find our way to the icon of Christ. The sacrament of confession is an integral part, offered by the Orthodox Church, in the process of repentance. This process will continually lead us back toward the path leading to Christ, as we strive to move forward on our journey as Christians. Ideally it would be best to have the parish priest present to answer any questions the young people might have. But it would be important at this time to discuss preparation and what happens during the actual confession. The flight to the moon could not have been accomplished without a "mission control" in Houston. The space men were in constant communication with their home base. If they had lost contact, they would have banished ø perhaps forever. One scientist said, "When Apollo II malfunctioned, without their computer it would have taken 90,000 years to find a new flight plan." Before the young people leave, pass out information on preparing for Holy Confession. O Lord my God, I confess that I have sinned against You in though word and deed. I have also omitted to do what Your holy law requires of me. But now with repentance and contrition I turn again to Your love and mercy. I entreat You to forgive me all my transgressions and to cleanse me from all my sins. Lord, fill my heart with the light of Your truth. Strengthen my will by Your grace. Teach me both to desire and to do only what pleases You. Amen.